Jenney Museum is known for its educational tours of Plymouth, Massachusetts, which focus on the Christian and family values of the pilgrims and how those values helped to form the United States’ government and society. The museum also houses three exhibition rooms, which rotate through different historical exhibitions related to the family life of the Pilgrims and the history of Plymouth. Walking tours include Discover Plymouth, which takes groups on a stroll through Plymouth’s historic waterfront, town square, and gardens to visit several historical monuments. A 3-hour walking tour of Boston meets off-site at the Boston Common and offers a Puritan’s guide to the Freedom Trail. This tour includes 11 of the 16 most famous sites along the trail, including the State House, the site of America’s first public school, the site of the Boston Massacre, and the USS Constitution, otherwise known as Old Ironsides. Walking tour participants should wear comfortable shoes and be dressed appropriately for the weather as all walking tours are outdoors. There are also tours for non-walkers. The Forefather’s Monument Tour is an in-depth look at the National Monument to the Forefathers, built in 1859 and completed in 1888. 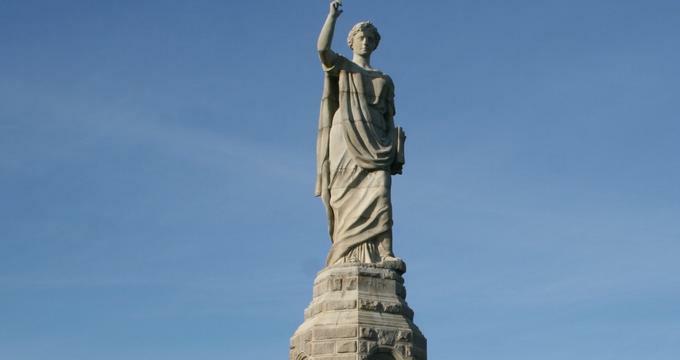 At 81 feet tall, it is the largest solid granite monument in America. This tour explores the five statues that make up the monument and their representation of the Pilgrim’s faith. This is a 40-minute tour and takes place outside at the monument. The Pilgrim Economics tour tells of the evolution from communal landownership to individual landownership and how the Pilgrims progression from the use of tools to machinery influenced today’s industry and capitalism in America. This tour is best for those with limited mobility and takes place indoors at the Jenney Museum. All tours offer age-appropriate content and are both educational and entertaining. Tours are led by a costumed guide who speaks the vernacular of their time. It is suggested that all tours are booked at least 24 hours in advance, although same-day accommodations are usually available. The Jenney Museum originally operated out of the site of the Jenney Grist Mill, built in 1636 by the Pilgrim John Jenney. Since 2011, the tour group has operated out of the Jenney Museum, just in front of the grist mill at the intersection of Spring Lane and Summer Street in Plymouth, Massachusetts. The house was built in 1749 and today is home to two exhibit spaces and a gift shop. The museum tells the story of industry in America, beginning with the original Jenney Grist Mill, the legacy of the pilgrims from their arrival on the shores of America through the present day, and the history of Plymouth. Leo Martin is a speaker, storyteller and historian who has operated the Jenney Museum and tours since 2001 with his wife Nancy. The museum houses three exhibition rooms. Past exhibits include The Pursuit of Happiness, which explored the “right to pursue happiness” and whether or not the Pilgrims achieved this goal, as well as Family – Cornerstone of Society, which depicted what family life was like from the time the Pilgrims left England up through the formation of the United States’ Constitution and the Declaration of Independence. A new exhibition called Were Pilgrims the First Abolitionists is an exploration of the Underground Railroad in Plymouth and Plymouth’s relationship with slavery from the time of the Pilgrims through the Civil War. For those interested in a deeper exploration of the Pilgrim’s relationship with God and the Christian influence in American history, the museum hosts a special series of talks with speaker and historian Leo Martin called The Pilgrim’s God Series. These talks are scheduled by booking in advance and may take place at the museum, at your church or school, or a nearby location of your choice. Plymouth is home to several historical attractions and museums, all near by the Jenney Museum. Visitors may enjoy the Pilgrim Hall Museum – the oldest museum in the United States – a tour of Plymouth Plantation and the Mayflower II, or Native Plymouth Tours, which offers tours of the area from the perspective of Native Americans.